It's always exciting when a New Zealand woman-directed feature comes out. There's been a big gap between Dana Rotberg's White Lies/Tuakiri Huna, in early 2013, and Michelle Joy Lloyd's Sunday, which premiered last weekend. In what's believed to be a world first, in a carefully designed multiplatform release by Dustin Clare and Michelle as distributors (Fighting Noise), Sunday opened simultaneously across more than twenty New Zealand cinemas, on television and the internet, on DVD and on airlines. Until now, Michelle was best known as producer of the internationally acclaimed Open Source film project Stray Cinema, which she founded in 2006 while living in Wellington. She produced and directed the first round of Stray Cinema film footage shot in London and screened at the first Stray Cinema screening event in London, 2007. Starring Dustin Clare and Camille Keenan, two award-winning Australasian actors, Sunday's a relationship drama in the vein of Richard Linklater’s Before Sunrise, Before Sunset and Before Midnight, about two people whose lives intertwine with the city they inhabit. It's set in Christchurch one year after the major earthquakes and is a story that mirrors Christchurch's story, including past devastation, beauty and a chance at rebuilding bigger and better than before. 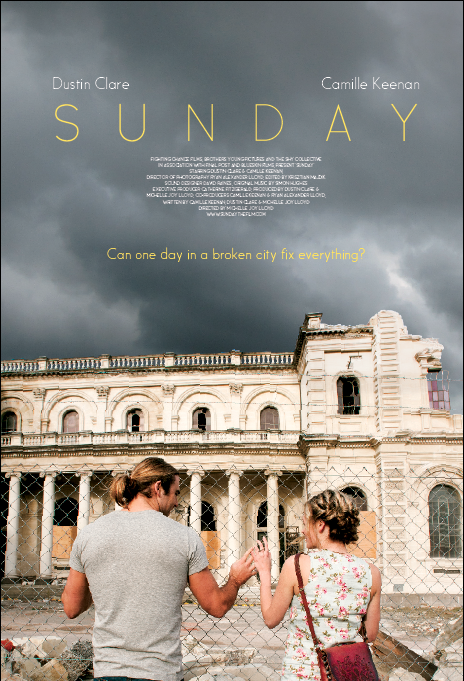 Sunday is a collaboration between two couples – Dustin and Camille, and Michelle and her husband, DOP Ryan Alexander Lloyd. Dustin came up with the idea on a sleepless night, wrote it down and sent it out to the team, who decided to continue with writing and producing the film together. It's had some great reviews, here, here and here (and here, if you can reach beyond beyond the Listener's paywall). Are you sure this is a world distribution first? How do you know? Since Dustin Clare and I decided to self-distribute Sunday two years ago, we have done significant research, consultation and surveying, with a focus on the problems that the industry is currently facing. Piracy was the main one we identified. We have never seen another film released onto five platforms (cinema, online, TV, airline, DVD) on the same day before. Often two, or three, but never five platforms all at once. A multiplatform release like ours is not necessarily the answer, but rather a response, in search of answers. We wanted to start changing the conversation around piracy, as we don’t think control is the only way to combat piracy. We are committed to letting our audience watch this film when they want, where they want, on whatever platform they want, at a fair and reasonable price. We are also committed to sharing our learnings with other independent filmmakers. What drew you to the story when Dustin sent it to you? The characters, and the themes explored which I could relate to. The story explores what it means to be in a young carefree relationship, and how that may change and mature over time, or perhaps not. It explores we might deal with the brokenness within ourselves and others, and the grey, when nothing is black and white, and as obvious as we might like it to be. I think as a whole, our generation are making decisions about relationships, family and even career later in life than say our parents or grandparents. It’s not necessarily all bad, there are so many options for us to choose from, or so it seems. However I think with all the choice we become hesitant, and end up putting off decisions which require a real commitment. In a way I liken it to a coming of age story, but for people in their 30’s. How did you share the writing? While Dustin and I contributed to writing scenes, Camille Keenan was instrumental in pulling it together and editing it, she has a real talent in writing, and is a strong and unique voice to watch in the future. As a group we spent a bit of time workshopping the characters and themes, however we wrote scenes individually, which Camille would edit and pull together. I really enjoyed the heavy collaboration of the project, we all challenged each other, and with our combined energy were able to keep moving the project forward. Beyond the writing, what were the highs and lows of making Sunday? Funding has been challenging, but we really believed in the film and the story, and decided to self- finance from the start. As a team we decided that going down the traditional funding route would take time, we were on a tight deadline to shoot the film because Camille was pregnant, and we wanted to capture that, so we didn't really have time to look for funding outside of our own resources. Also romance dramas are an unusual genre in New Zealand, and we didn't want funding to sway the story we wanted to tell, so we decided for this reason to self-fund. As it was shot in Christchurch, we did approach the New Zealand Film Commission after we had an initial edit. They supported us with a small grant, but we kicked in our own funds again and crowd funded in order to finish and distribute. Because of restricted budgets, we couldn’t finish the film as fast as we might have liked, this has been a point of frustration at times. However, in hindsight I believe this time has allowed us to keep crafting and shaping the film into what it is now, with more perspective and reflection. It’s been an endurance project in some ways, there have been many highs, but also many struggles, emotionally and also resource challenges. I’m really proud that we got there together, and I do believe what we have made is an honest film with important questions, that will hopefully challenge people to continue the conversation after the ending of the film. I'd love to know more about your background as a filmmaker. This is my debut feature film. I did direct a short film when I lived in London, and created an online film project called Stray Cinema out of it, where we made the footage Open Source, and available for anyone in the world to edit and tell their own story with. I have also worked as a digital producer for the last 10 years, and online is a space I feel comfortable, although it’s ever changing, I think that is reflected in the way I decided to release my work. Obviously Richard Linklater’s one influence. Who are the others? I am a fan of what I like to call 'quiet films'. Films that explore questions rather than push an answer. Subtle storytelling that sometimes asks quite a bit of a viewer, but the investment is always satisfying. I am interested in exploring naturalistic moments, how they might actually play in reality. Some other films that I am inspired by include The Exploding Girl, The Dish & the Spoon, Medicine for Melancholy, and Alyx Duncan’s The Red House. Exploring pregnancy was heavily influenced by Camille being pregnant at the time of writing and shooting, though I must admit I am a huge fan of Away We Go. Did it help that Dustin and Camille are a real-life couple and that your DOP is your partner? And/or were there couple-specific challenges? Working as two couples had its advantages and challenges. There is a chemistry and playfulness that comes out of Camille and Dustin being partners in real life, however while on set they were well in truly in character. They are both professionals, and I felt really privileged to work with them both as a first time director, and that they trusted me. The film is a heavy collaboration, and as four passionate individuals with different opinions, it has been challenging at times. However we have the same goal – to tell the best story we possibly can. The way I like to work is collaborative, and working as two couples came about by circumstance. Dustin and Camille approached Ryan and I with the story, and we jumped on board immediately and started writing. I do think that if you are lucky enough to have a good producer, you have the beginnings of a creative and business team that will make an idea a reality. However I don’t know what it would be like for me on my own with a producer, as it has not been my experience as of yet. Camille and I started a production company earlier this year called the Shy Collective. The idea is to start gathering a collective of women filmmakers, in key positions such as writing, directing, shooting, to help tell our stories. I find it so exciting when I find a female voice I connect with in film, so the aim of Shy Collective is to support more films about women, by women. I think Sunday is a fine example of the type of work we hope to produce. A women’s collective does not limit the team to just women, but I think it tries to focus on stories by women for women, to nurture a voice that often does not get heard in film, statistically speaking. What I love about Sunday, is while I do think the female sensibility is strong, Camille and I wrote the script with Dustin, so there is a real sense of both voices in there. I am inspired by collectives such as the filmmaking team behind Beasts of the Southern Wild. Essentially a team that continue to support and work on each other’s projects. Other examples of general collectives include Rough House Pictures and Blue Tongue Films in Australia, and there are many more. Why do you think there are so few women-directed features? Does it matter? I really don’t know the answer, but I think the question is a valid one, and needs to be a serious point of discussion in the industry, lead by the New Zealand Film Commission. It needs to change. There are some wonderful female directors in New Zealand, take for example Alyx Duncan who directed The Red House, hers is a beautiful and unique film to come out of New Zealand, and I hope to see a second feature from her one day soon. I think Yamin Tun and Michelle Savill are also both interesting filmmakers to watch, they have had shorts funded by the New Zealand Film Commission, but would love to see a feature. There are many more, I know our executive producer Catherine Fitzgerald is working on development of a feature with Gillian Ashurst. I can’t wait to see what she follows up Snakeskin with. How can other women emulate your achievement? What did you or other people do, to make it possible for you to direct Sunday? I think building a strong team of people is essential to getting a film made. Directing is just one role in a team of many hard working individuals, that seems to get mentioned quite a bit once the film is finished. Sunday from start to end has been a collaboration between myself, Camille, Dustin and Ryan. Also people like Catherine Fitzgerald, who we approached early once we had an assembly edit, to be an executive producer on the film, have played an important role the process. I know Catherine is also an example of a highly creative and involved producer, who won’t hesitate to sit up until 1am in the morning working with a director on anything from script to shoot. I admire her, and the projects she get’s involved with, that’s why we were thrilled when she agreed to be involved with Sunday as an EP. I also think support from my husband, family, friends, and at a later stage sponsors, were imperative in my experience. Why did you choose to support the White Ribbon and Gap Filler groups? From the very start, the whole team were committed to giving back to Christchurch city, aware that the people, like the city had been through so much. 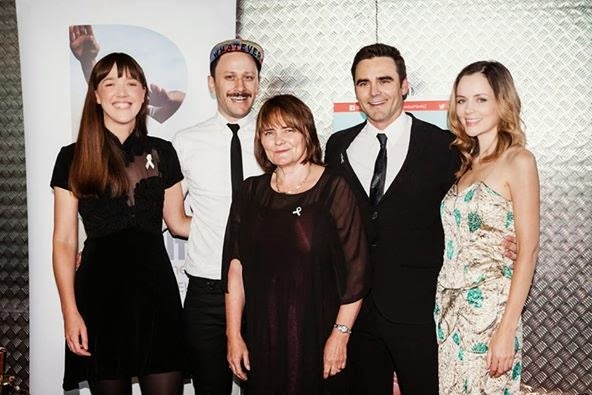 $1 from every ticket sold at the Auckland, Wellington and Christchurch Premiere Events will go to the Christchurch branch of the White Ribbon Trust, for whom Dustin Clare is an ambassador. Many of the triggers of family violence have been magnified due to stress placed on the city and its inhabitants following the earthquakes some 4 years ago. Instead of pressure easing, it’s getting worse as people are feeling worn down, worn out and frustrated. 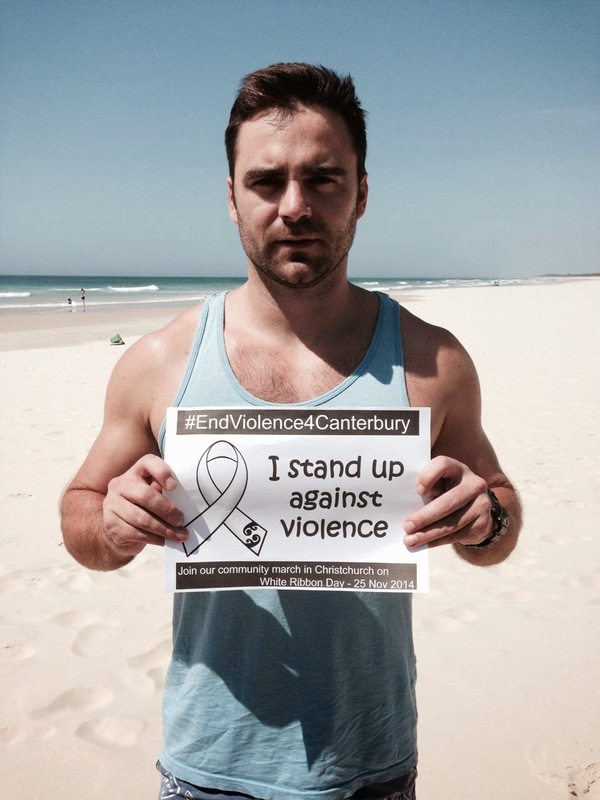 Now more than ever we believe Christchurch needs organisations like the White Ribbon Trust. 10% of all profits from the film will be donated back to Gap Filler so they can continue to help encourage the Christchurch community grow and heal through creative endeavours, something the team feel very strongly about. Now Sunday's good to go, what advice do you have for people following a similar path? Do you have more features in development? I have a few ideas, but right now I am 100% focused on getting Sunday out into the world, and giving it the best life we can. City & Regional cinemas across New Zealand, where filmmakers will participate in Q & As in the week of release. More info on the Sunday website. Rialto Channel - SKY 39 7pm.